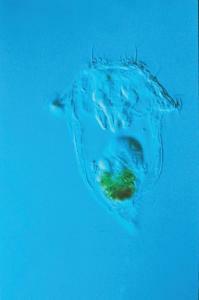 Rotifers are well adapted to adverse conditions; when dry, the eggs remain viable for years. Now you can demonstrate this adaptation by reconstituting the dry eggs supplied. Just add water, and the eggs of different Rotifer species begin to hatch in 24 hours, completing their process in only 72 hours. These freshwater rotifers grow best on a diet of microalgae and Roti-Rich, available separately. Instructions are included.